100% Organic Liquid Iron contains a unique, fully-certified organic source of iron extracted from Murraya koenigii leaves. Together with standardised extracts from Guava, Lemon, Holy Basil and Amla to provide guaranteed levels of vitamins B and C. With Seagreens® organic arctic wrack seaweed, acerola, nettle, dandelion, honey and orange oil. 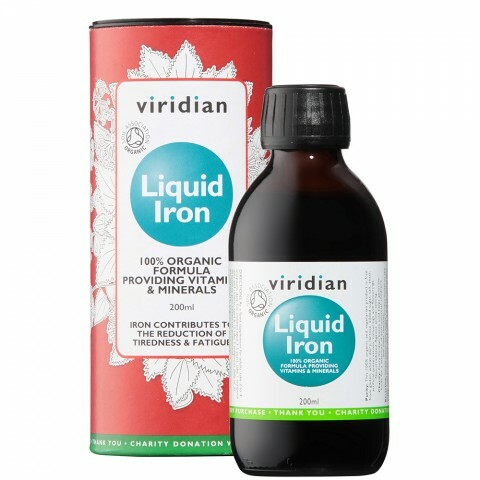 100% Organic Liquid Iron is pleasant-tasting and suitable for all the family, including during pregnancy and breast-feeding, for children, the elderly, the highly active, vegetarians and convalescents. Non-constipating. Iron is essential for the healthy production of haemoglobin and red blood cells. Iron contributes to the reduction of tiredness and fatigue and contributes to normal cognitive function. Iron 20mg, Vitamin C 80mg, Vitamin B1 4mg, Vitamin B2 5.2mg, Vitamin B3 8mg, Vitamin B5 8mg, Vitamin B6 5.6mg, Folic acid 160ug, Iodine 120ug.